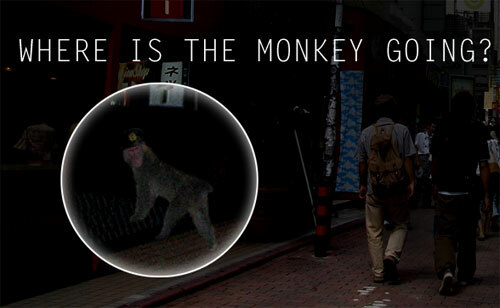 That crazy little monkey that’s been taunting Tokyo police since August 2008 has moved into a new home. It seems the wacky macaque monkey – dubbed Makawaii – spends its nights at an internet café. The impish ape first showed up – alone – at Shibuya train station in Tokyo in August, 2008. The critter dodged a police dragnet and has been living undercover for almost 6 months. We’ve learned now that the cyber café home to the monkey is authorized to act as the monkey’s official address, which will be helpful if the ape is searching for a job. However, the macaque’s posts on Twitter suggest the simian prefers peeing on its cubicle neighbors between sessions of computer gaming and late-night snacking. Click here to see new unretouched photos and read the update on the Tokyo Shibuya monkey.